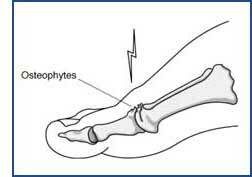 The most common site of arthritis in the foot is at the base of the big toe. This joint is called the metatarsophalangeal joint. It's important because it has to bend every time you take a step. If the joint starts to stiffen (stiff big toe), walking can become painful and difficult. In the 1st metatarsophalangeal joint, the ends of the bones are covered with a smooth articular cartilage. If wear-and-tear or injury damage the articular cartilage, the raw bone ends can rub together. A bone spur, or overgrowth, may develop on the top of the bone. This overgrowth can prevent the toe from bending as much as it needs to when you walk. The result is a stiff big toe, also known as Hallux Rigidus. Hallux rigidus usually develops in adults between the ages of 30 and 60 years. No one knows why it appears in some people and not others. It may result from an injury to the toe that damages the articular cartilage, or from differences in foot anatomy that increase stress on the joint. If you find it difficult to bend your toe up and down or find that you are walking on the outside of your foot because of pain in the toe, see your foot specialist right away. Hallux rigidus is easier to treat when the condition is caught early. If you wait until you see a bony bump on the top of your foot, the bone spurs will have already developed and the condition will be more difficult to treat. Your specialist will examine your foot and look for evidence of bone spurs. He or she may move the toe around to see how much motion is possible without pain. Your family doctor may order X-rays to show the location and size of any bone spurs, as well as the degree of degeneration in the joint space and cartilage. Pain relievers and anti-inflammatory medications may help reduce the swelling and ease the pain. Applying ice packs or taking contrast baths (described below) may also help reduce inflammation and control symptoms for a short period of time. These aren't enough however, to stop the condition from progressing. Wearing a shoe with a roomy toe box will reduce the pressure on the toe, and you should avoid high heels. Your foot specialist may recommend that you wear a stiff-soled shoe with a rocker or roller bottom design and possibly even a steel shank, or an orthotic insert. This type of shoe supports the foot when you walk and reduces the amount of bend in the big toe. A contrast bath uses alternating cold and hot water and is a good way to reduce inflammation. You'll need two buckets, one with water as cold as you can tolerate and the other with water as warm as you can tolerate. Immerse your foot in the cold water for 30 seconds, then immediately place it in the hot water for 30 seconds. Continue to alternate between cold and hot for five minutes, ending in the cold water. You can do contrast baths up to three times a day. However, be careful to avoid extreme temperatures in the water, especially if your feet aren't very sensitive to heat or cold or you’re a diabetic. Always remember to start and end with the cold water. This surgery is usually recommended when damage is mild or moderate. It involves removing the bone spurs as well as a portion of the foot bone, so the toe has more room to bend. The incision is made on the top of the foot. The toe and the operative site may remain swollen for several months after the operation, and you will have to wear a stiff-soled sandal for at least two weeks after the surgery. But most patients do experience long-term relief. Fusing the bones together (arthrodesis) is often recommended when the damage to the cartilage is severe. The damaged cartilage is removed and pins, screws, or a plate are used to fix the joint in a permanent position. Gradually, the bones grow together. This type of surgery means that you will not be able to bend the toe at all. However, it is the most reliable way to reduce pain in these severe cases. For the first six weeks after surgery, you will have to wear a cast and then use crutches for about another six weeks. You won't be able to wear high heels, and you may need to wear a shoe with a rocker-type sole. Older patients who place few functional demands on the feet may be candidates for joint replacement surgery. The joint surfaces are removed and an artificial joint is implanted. This procedure may relieve pain and preserve joint motion.